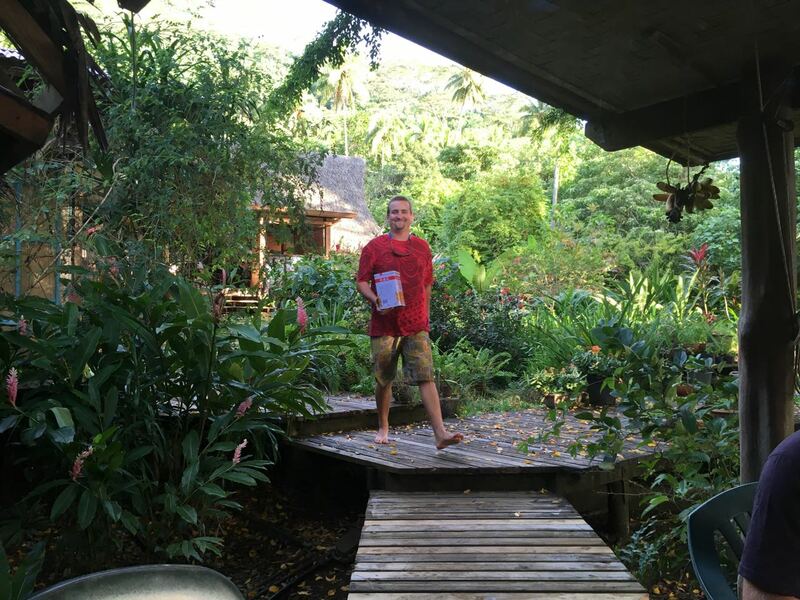 We met Nate first since he's regular crew for our good friend and mentor, Linda C. He's an accomplished sailor and volunteered to go with us part-way to Fiji, taking the first section from Tahiti to Rarotonga in the Cook Islands. We met Val through him. They're married now and both have become close friends. 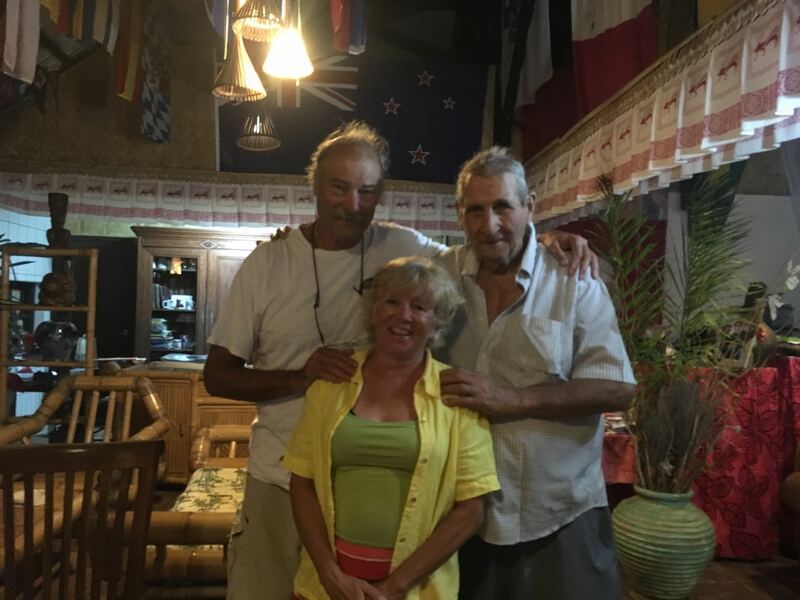 They're both bright and adventurous people and we welcomed their interest in sailing with us. Anytime! No, this is neither Nate nor Val. 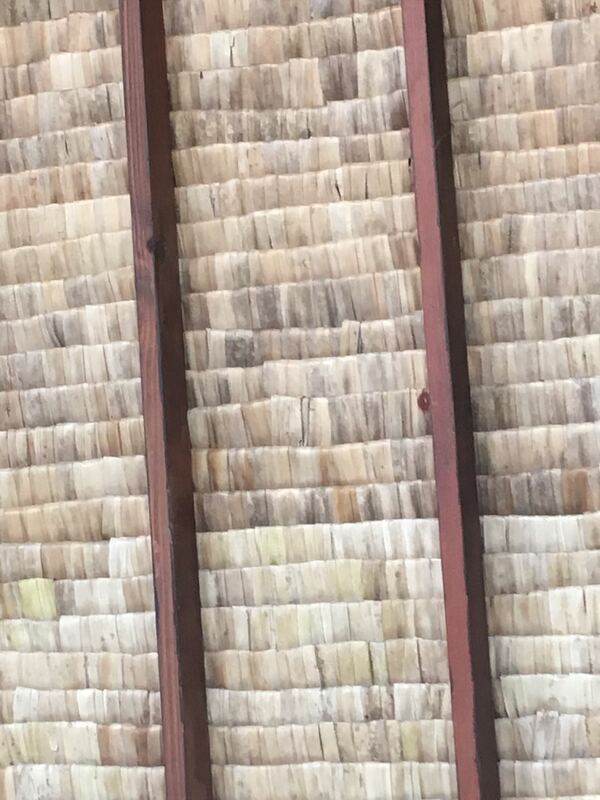 As we awaited their arrival at Vaitape on Bora Bora, I was fascinated by the roof construction of the open-air passenger area. Here they are, disembarking from the shuttle. We all jumped into our dinghy and returned to the boat after a quick tour of the tiny town of Viatape. 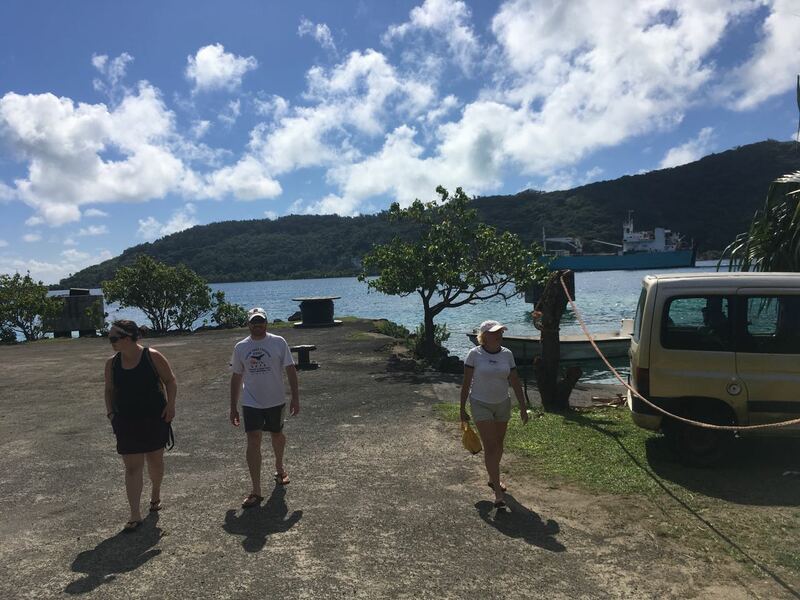 After riding the dinghy back to Wings and getting settled aboard, we went walking down Fa'anui Bay. 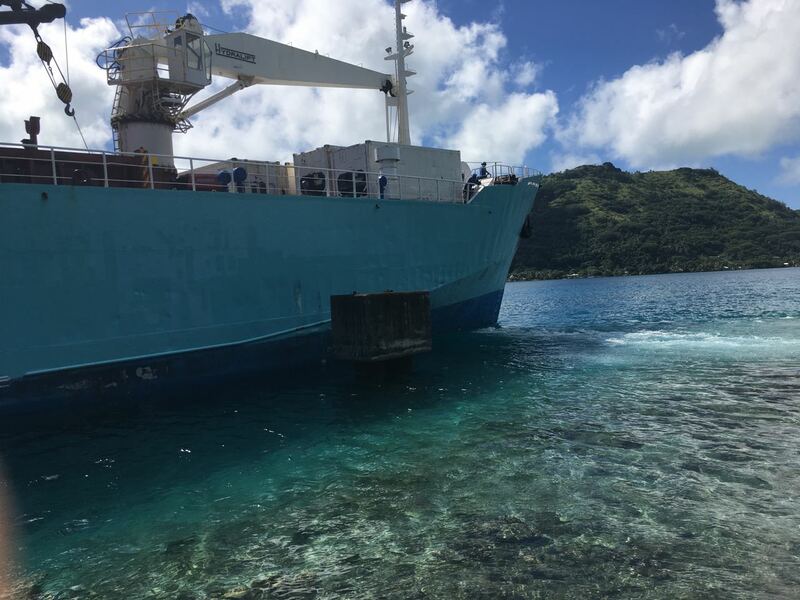 Near the Bora Bora Yacht Club where we were moored, we came upon this freighter loading from the bow. 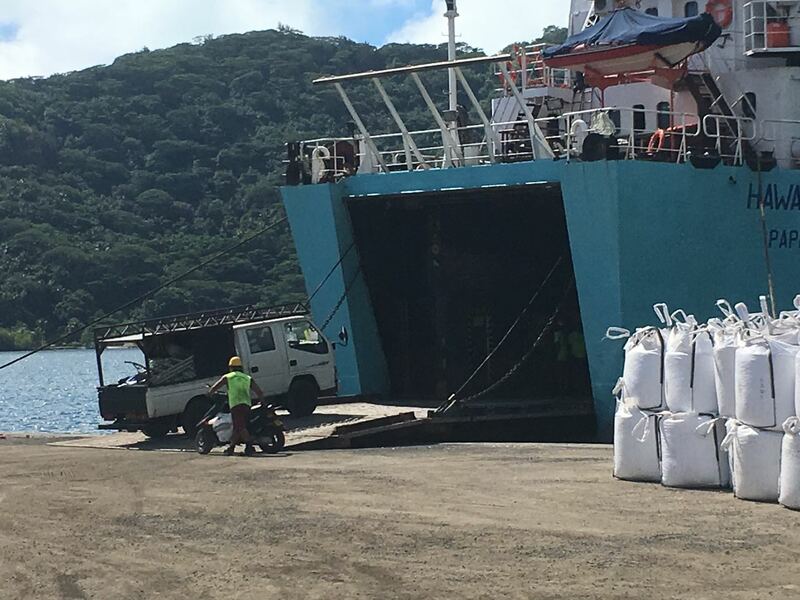 The white bags are the typical and common loading container for everything from garbage to copra. 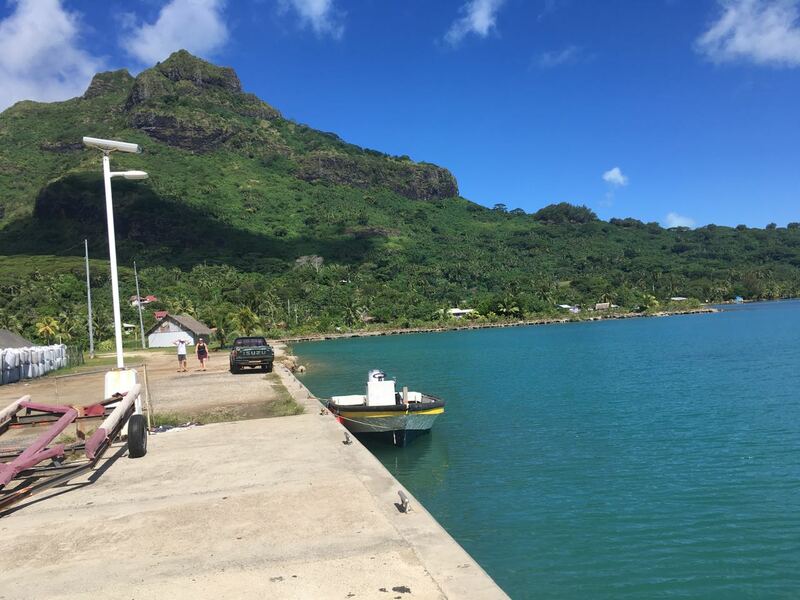 This dock, by the way, is the original World War 2 facility built by the Americans to supply forward areas of the Pacific war. After loading, the vessel pulled away from the dock and pushed away from shore with bow thrusters, visible here in the clear water. Here the trio continues our walk from the loading facility. At the head of Fa'anui Bay is this lovely loading area. We've never seen it in use, but it's a lovely facility. We caught a fish! 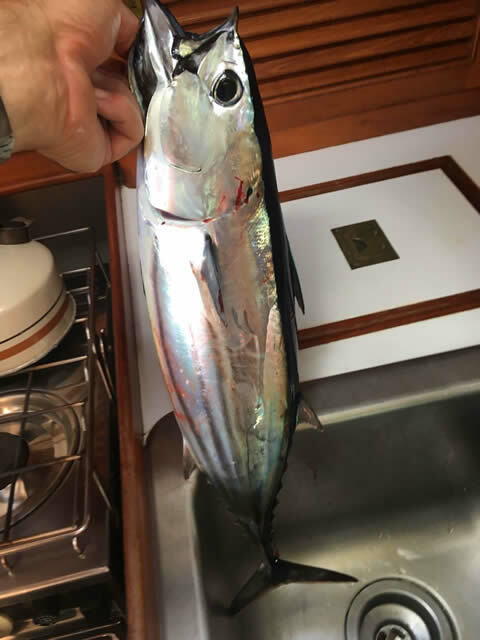 It's a skipjack tuna, and was delicious. 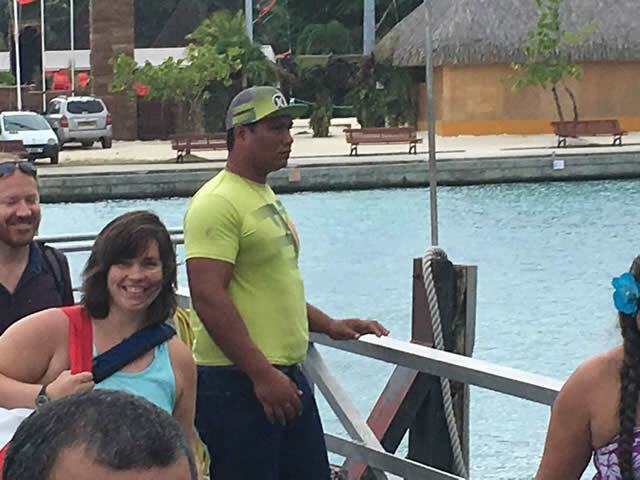 Bill trolled as we sailed between Bora Bora and Taha'a (sister island to Raiatea), using a pink squid lure. 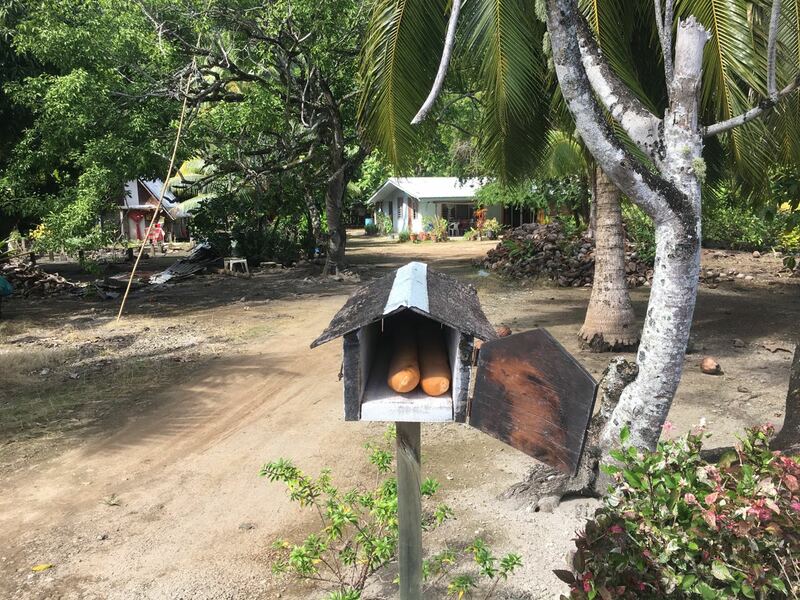 We've shown you these little houses on posts that front most houses in French Polynesia, and this one has the entire story since it's full of baguette! Just imagine receiving fresh baguette each day, delivered to your door. We found a mooring in our favorite Tapuamu Bay, took the dinghy ashore and went sightseeing. 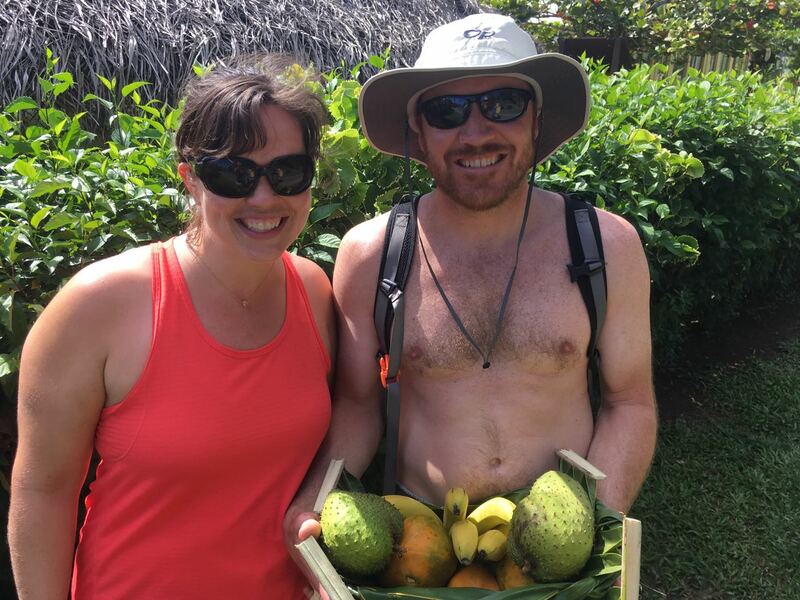 We passed a little fruit stand, and just our interest sparked the Polynesian graciousness. The owner gave us the entire basket of fruit AND the lovely, hand-woven basket! Nate and Val glow. 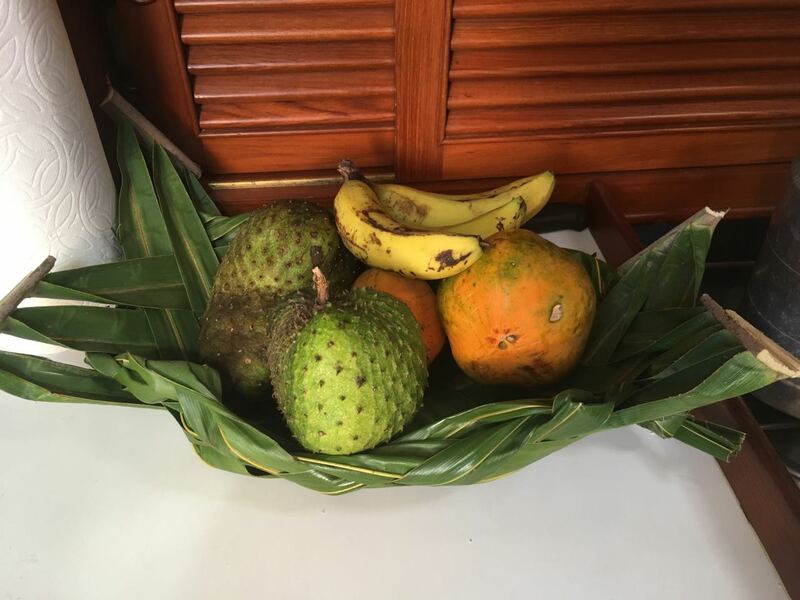 Breadfruit (the green, spiked fruit), bananas, and papaya lie in this beautiful basket. Look at the lovely weaving. 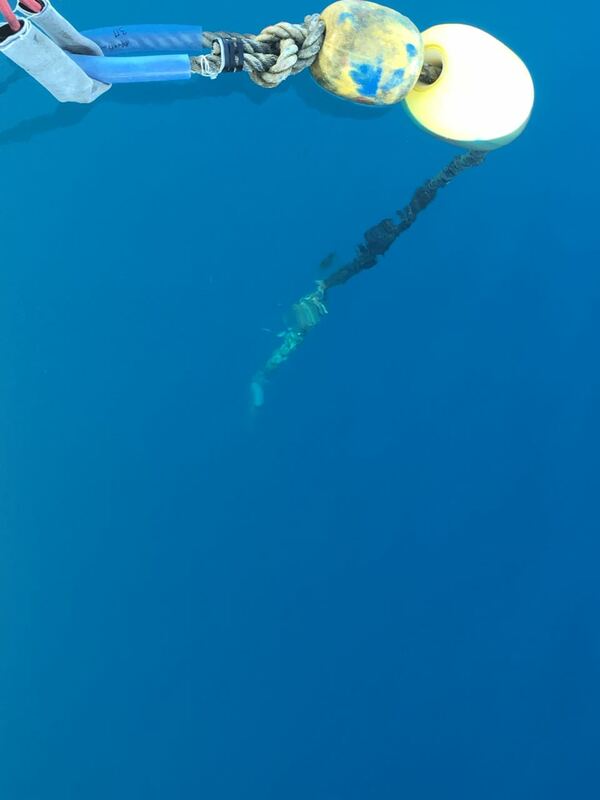 Nate showed me this lovely scene of our mooring line descending and finally disappearing in the clear water of Tapuamu Bay. Tapuamu Bay opens due West, so we motored South and East to Ha'amene Bay, a journey around the south end of the island to the Southeast side. 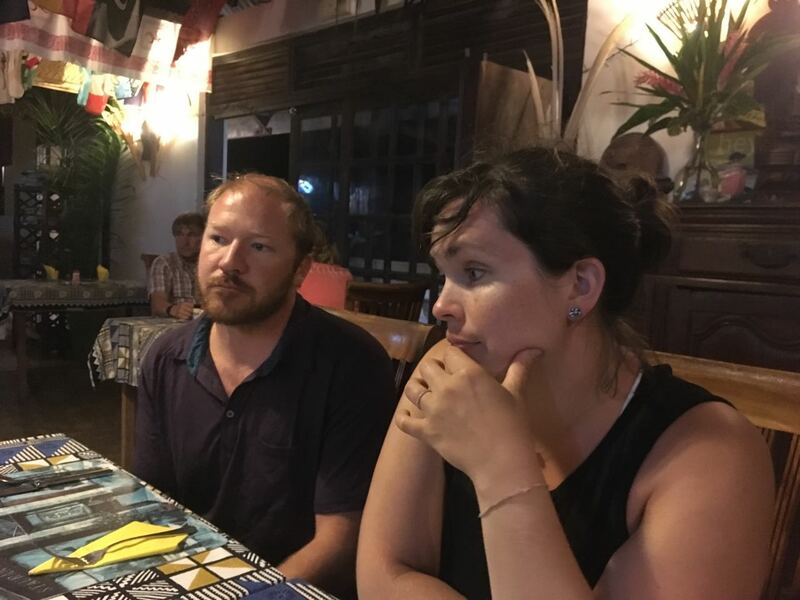 We wanted Nate and Val to enjoy the unique Hotel Hibiscus, and here we sit. 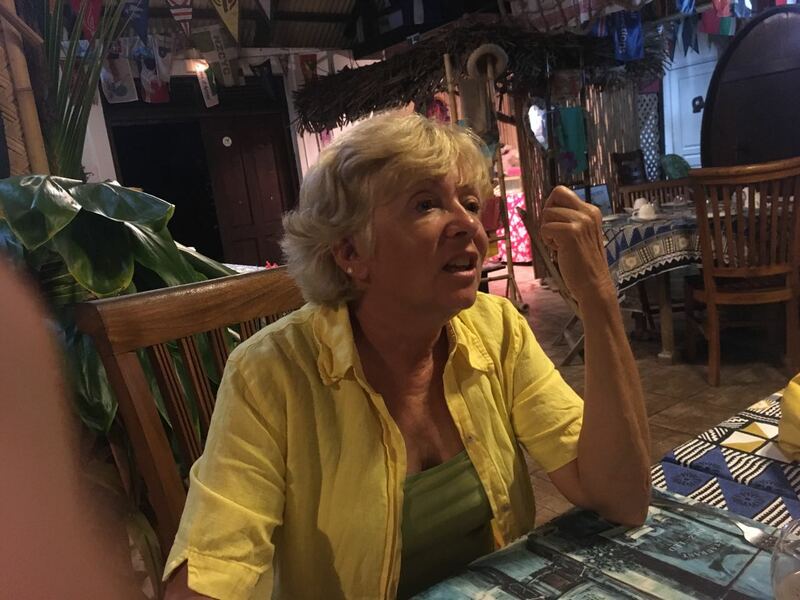 Lovely Conni tells a tale while awaiting our dinner. She's blonde from months on the boat. Dinner is presented on this lovely table. 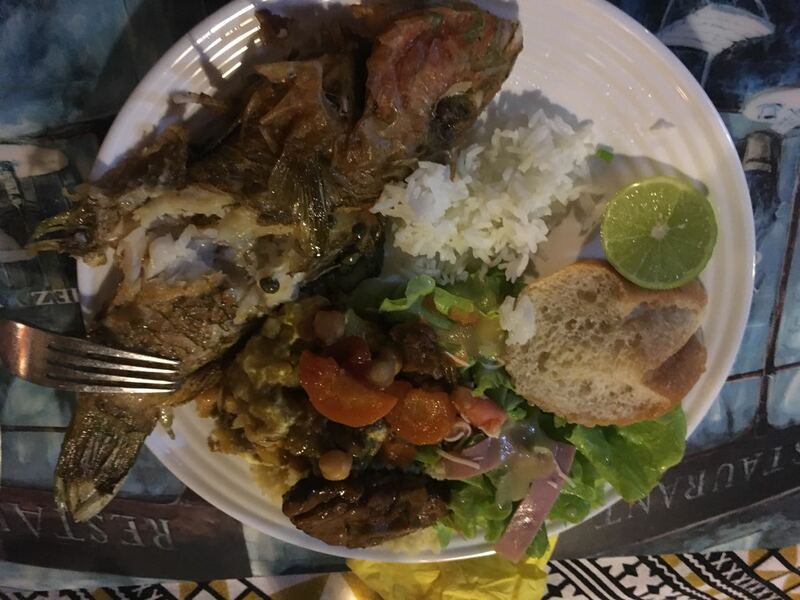 Whole grilled fish and lots of sides were all perfectly prepared. The hungry crew of Wings dives in to the meal: Nate, Val, and Conni take the right side of the table. 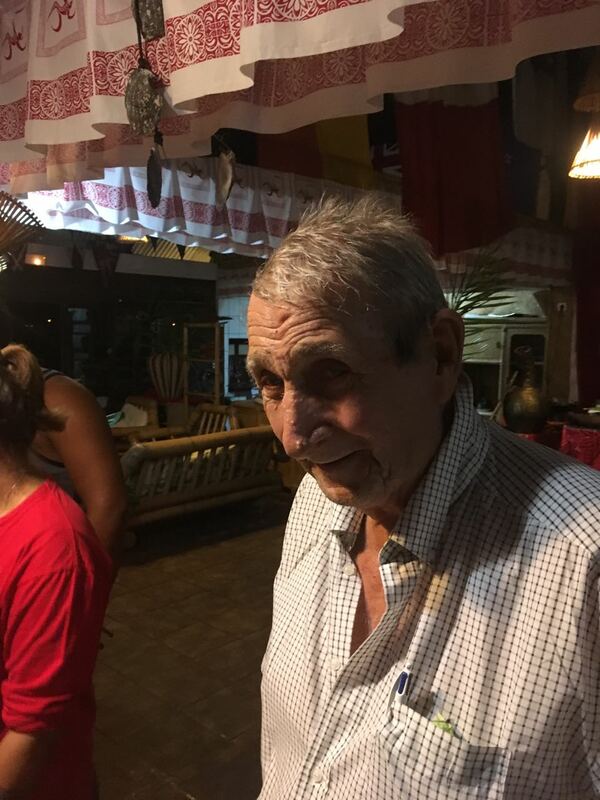 Leo, the proprietor and builder of the Hibiscus Hotel was our host. 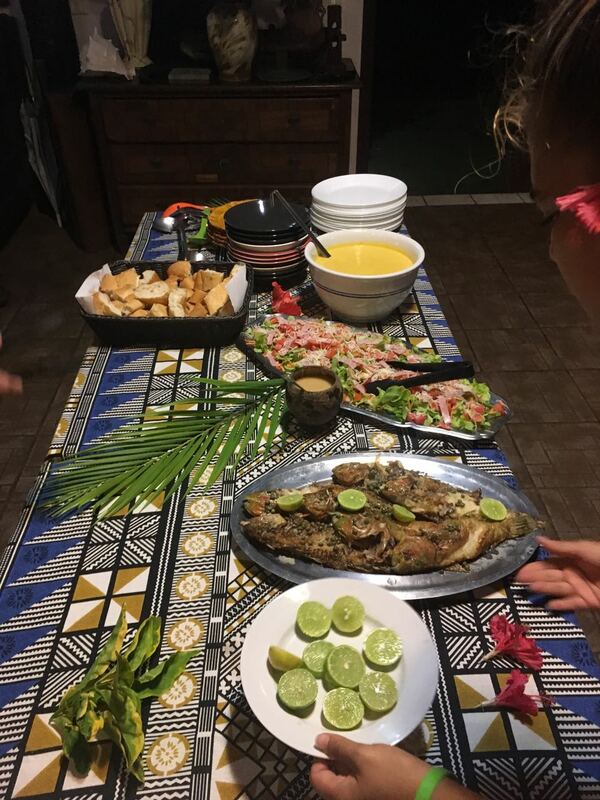 A South Pacific meal fit for royalty! Leo, Conni, and Bill pose at meal's end. What a guy. 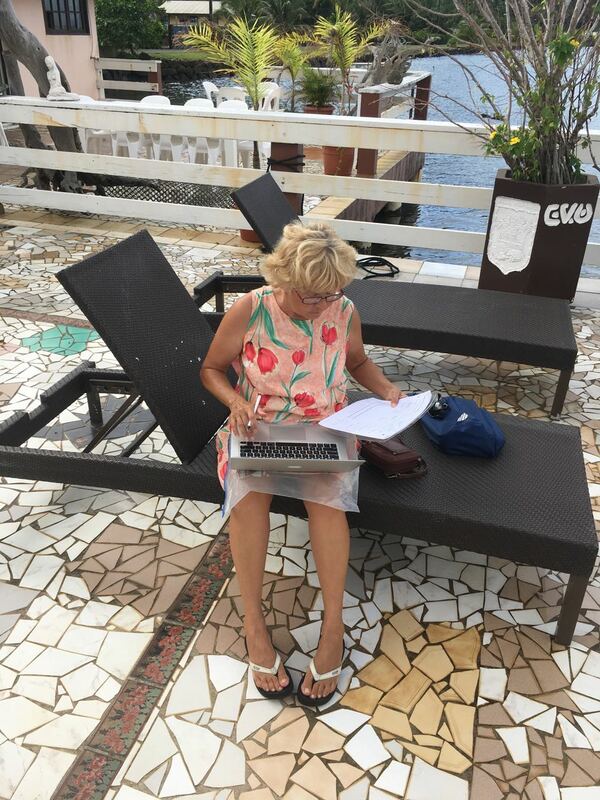 Lovely Conni uses Wifi from the Hibiscus to acquire our tickets home. Thanks, Conni. 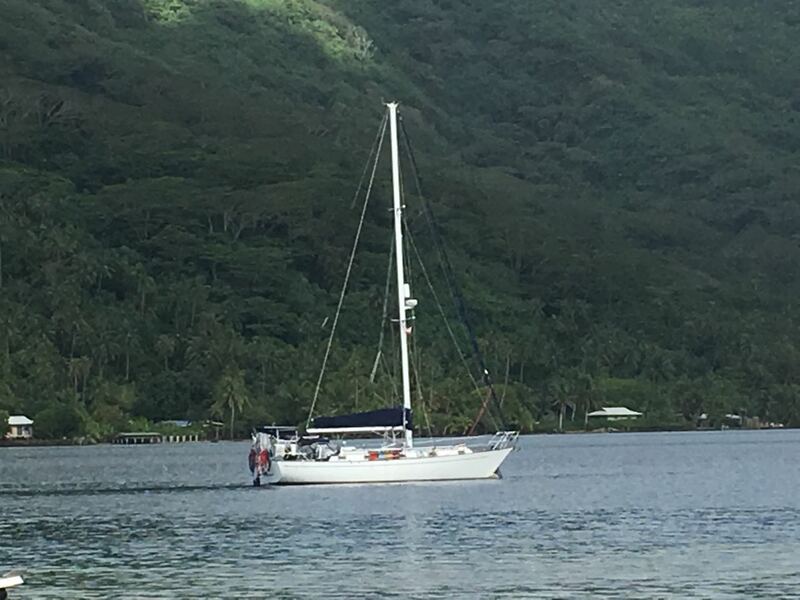 Our home and transportation, Wings hangs from a mooring near the Hibiscus Hotel in Ha'amene Bay. 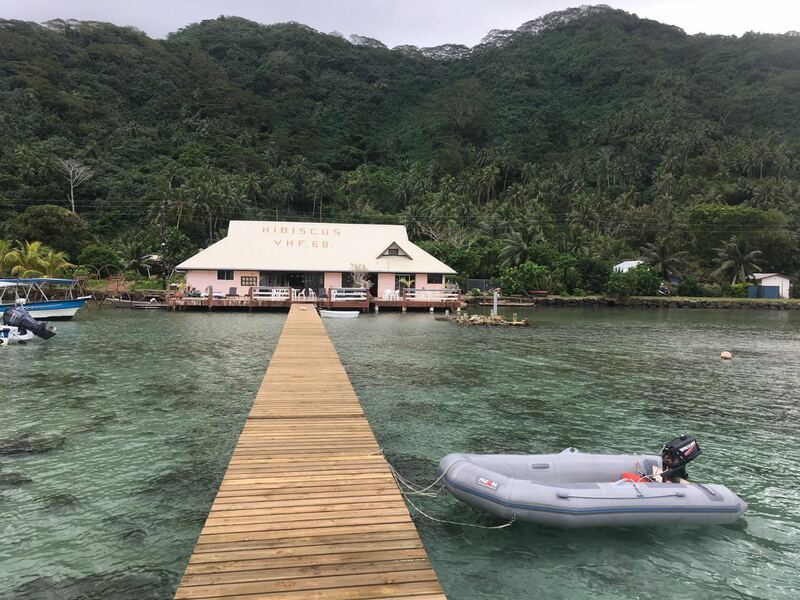 The world-famous Hibiscus Hotel, it's new dinghy dock, and our dinghy in a typical scene. 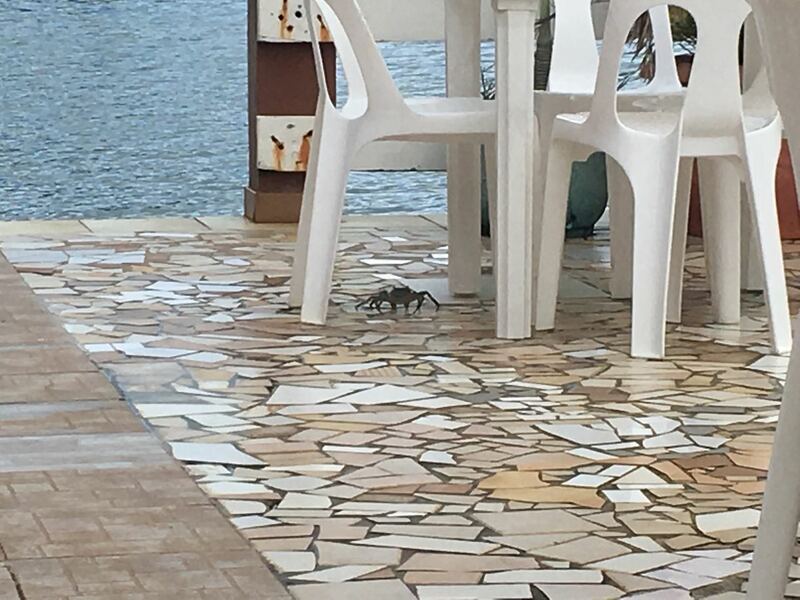 A local crab looks for table scraps on the Hibiscus patio. 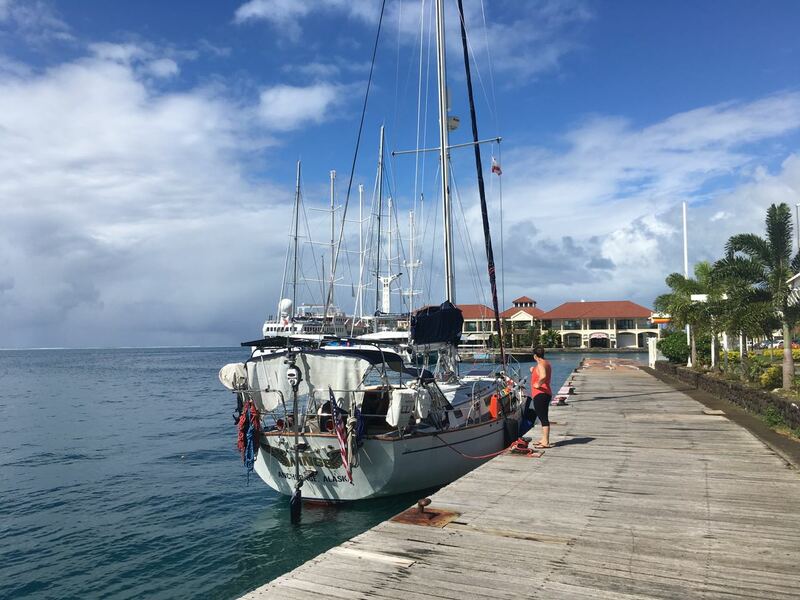 Wings and crew on the dock in downtown Uturoa, Raiatea. Taha'a and Raiatea are sister islands within the same reef. 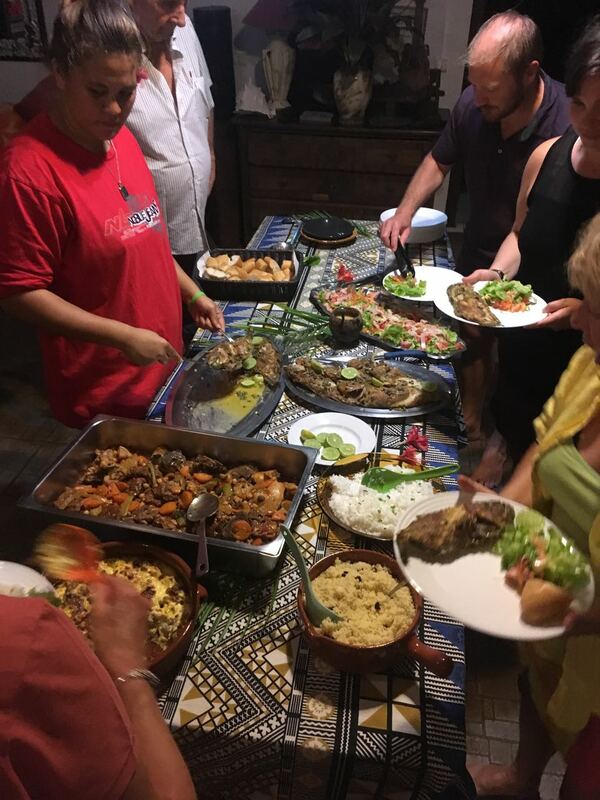 Like all of our visitors, we want them to meet and participate in the vanilla tour hosted by Noah and his family. We've become friends with him through the years and we always spend an evening with him. Here, he approaches with a can of crackers. Bernard Moitessier, my hero, sat in this bungalow and wrote a book. 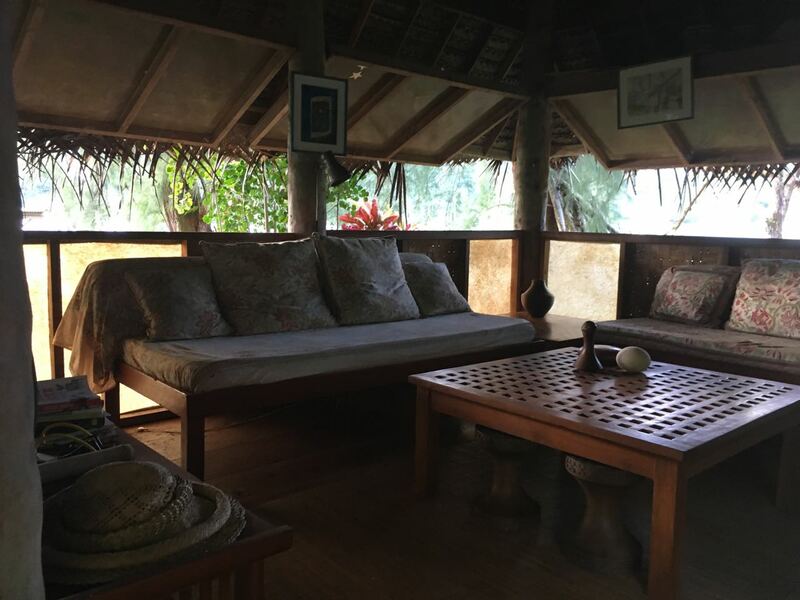 Alas, as with all things, the bungalow must be replaced since the tropical environment and insects destroy much. I'll miss this room and history. 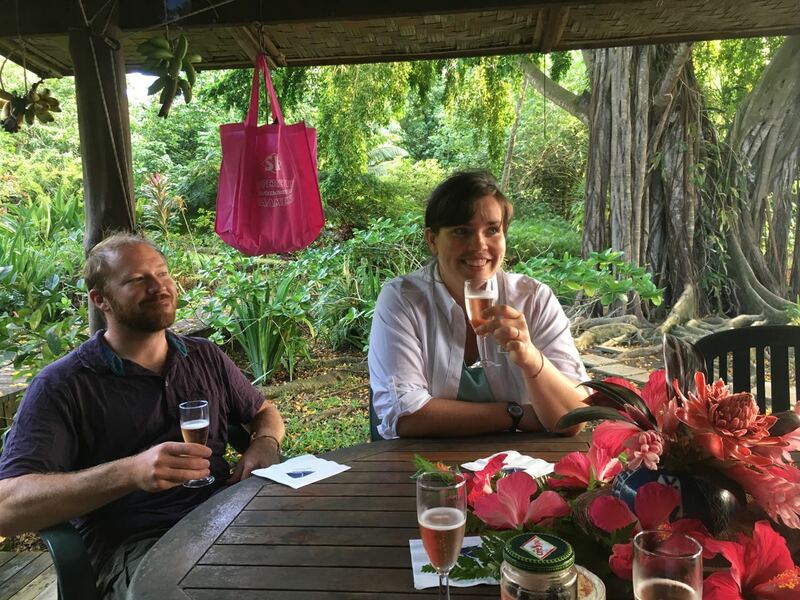 Nate and Val join us on this beautiful veranda for drinks and conversation. 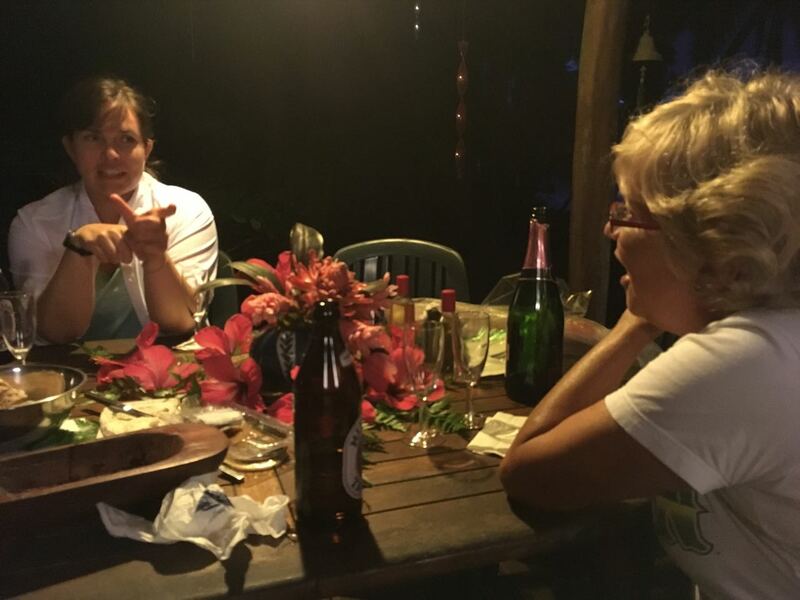 Yes, it's night now, and we're still drinking and talking. It was a highlight of the trip.